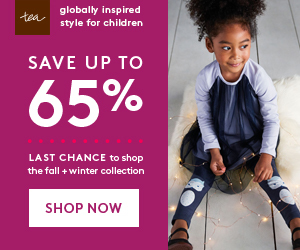 Say so long to winter with styles up to 65% off. Beginning today (3/19) through Friday, (3/22), Tea is offering last season's styles at lower than ever prices. Shop $7 tees, $10 dresses, $15 rompers, and more. Tea Collection inspires global connection and curiousity for little citizens of the world. Now is a great opportunity to stock up on some favorites for the next fall season. Many of these styles are also suitable to wear during the spring months.There are days when there may still be a little chill in the air. Twirl it up with this two-piece set. Floaty tulle in dreamy lilac and front-printed leggings keep it fancy free and oh-so-comfy. Keyhole closer and soft cotton fabric for easy dressing. Available in sizes 3-6 Months to 18-24 Months. Baby is always the prize catch, but this cute contrasting romper ups the ante. Available in sizes 0-3 Months to 18-24 Months. This cat has a Motown soul, and this shirt has outfit possibilities. Available in sizes 2-8. Floral meets leopard meets pop art for two cute stems. Available in sizes 2-8. Navy camp plus pockets and tie waist = tres Sportif. Available in sizes 7-16. Cool stripes and a raglan sleeve make this a perfect winter stand-by. Available in sizes 2-16. Comfy wide wale cord, an elastic waist and reinforced knees mean he's always ready to go. Available in sizes 2-16.